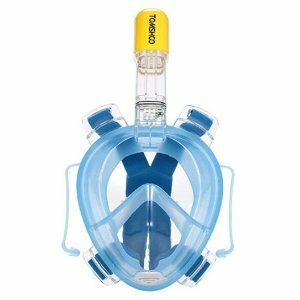 Amazon.com offers TOMSHOO 180° full face Snorkel Mask with Action Camera mount for $20.5 (5 Colors for Choice), via coupon code "JOA9D86V". ANTY-FOG Design helps eliminates fogging and makes it easier than ever to breathe. DRY SNORKEL Technology Stops salt water from getting into your mouth and prevents gagging. 180° viewing area- the biggest of any snorkel mask on the market today guaranteeing that you will see underwater more fish and sea creatures than ever before. A snorkel on a dry tube, a flexible piston design that prevents seawater from entering your mouth and preventing nausea. Spend less time to worry about your mask. Waterproof earplugs prevent water from entering your ears, spend more time to enjoy the fun of swimming. Constructed of one piece shatter-proof and clear polycarbonate, which will guarantee a quality, long-lasting device to take on all your adventures. Never worry about cracked or split snorkel tubes.